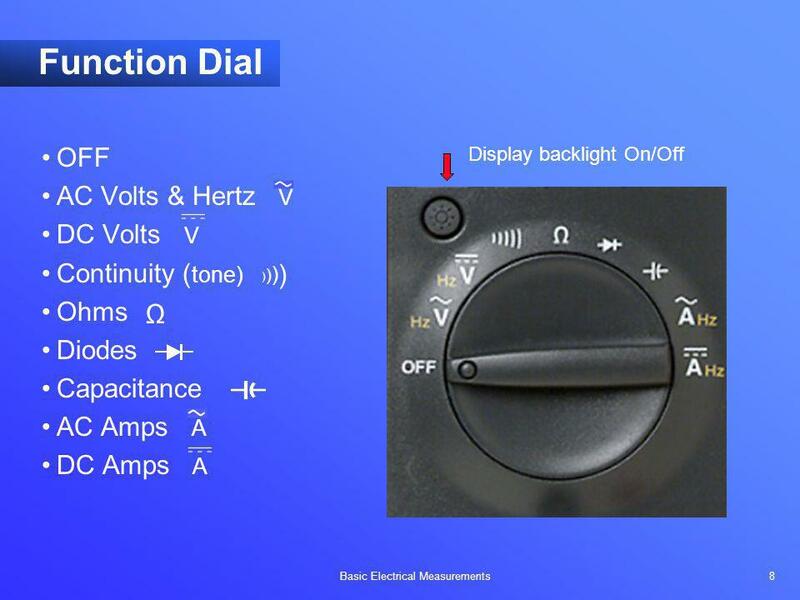 Display Function Dial Probe Input Jacks Function Buttons Objectives: This presentation material is designed to put the meter in the hands of the student as soon as possible. In addition, the material is designed to introduce “safety thinking” and safety practices as soon as possible. Continue inspection of meter, with emphasis on safety information. 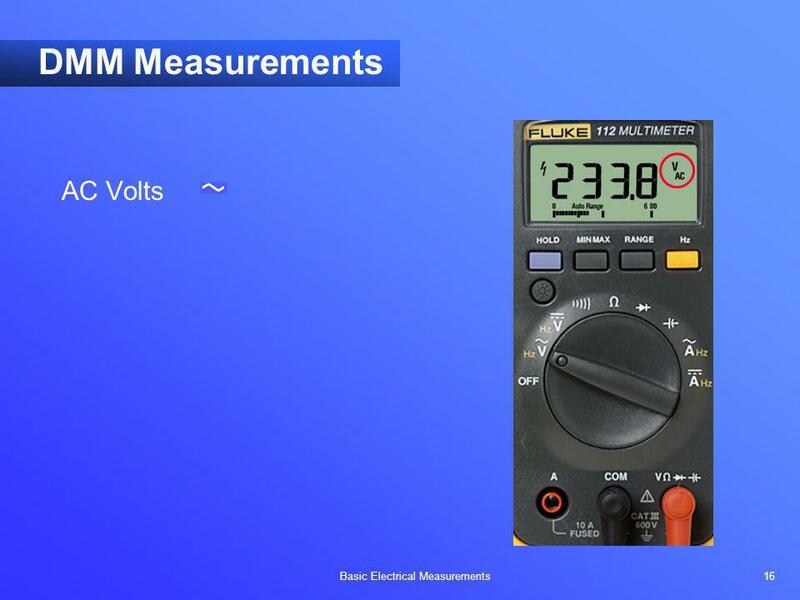 There is a lot of information on the back of the meter that users often ignore. 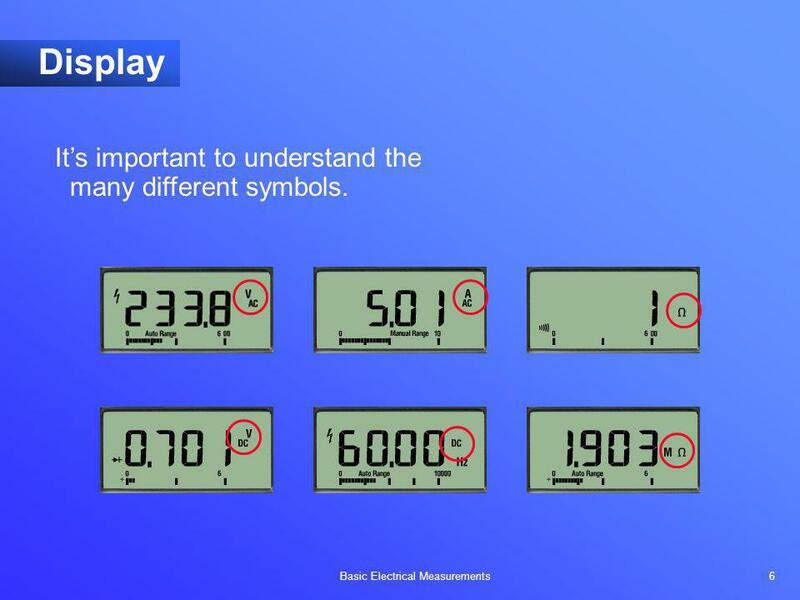 This exercise gets the meter in the student’s hands and gets them asking questions. Fuse are specified for 11 A inputs. They are rated 1000 V. Questions might arise about the IR (interrupt ratings): why are they only 10 kA or 17 kA, when branch circuit breakers can have IRs of 22 kA, and main 3-phase breakers can go to 100 kA of interrupt current. 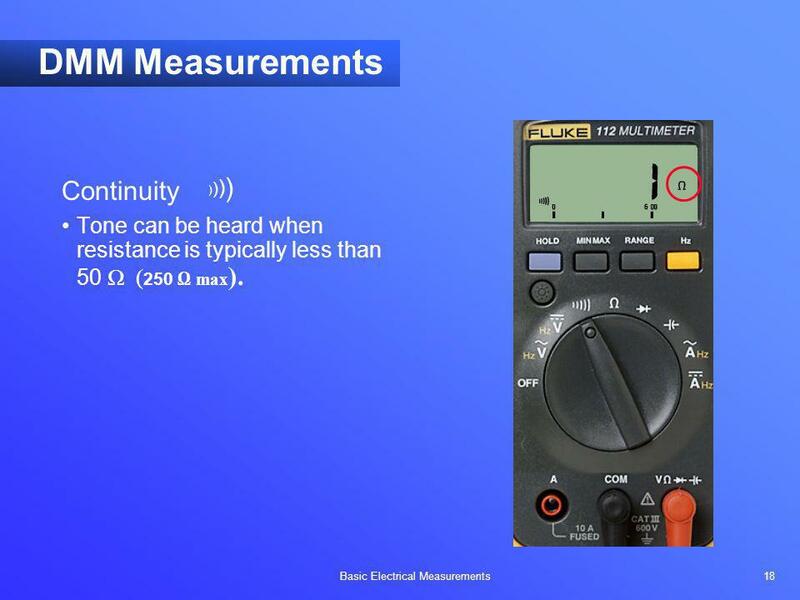 The quick answer is that the input impedance of the leads and the internal circuitry limits the fault current to a maximum of 10 kA or 17 kA at 1000 V and under, regardless of the available fault current. These custom-designed fuses have been tested on source circuits at the Bussman facility of over 100 kAIC. This will be covered in the safety presentation. Holding the Hold button down during turn-on shows all display symbols. The battery indicator is very important information that is overlooked by many users. 6 Display It’s important to understand the many different symbols. Objectives: Immediate hands-on measurement exercise to explain TouchHold. We recommend you use a battery for measurements because, at this point in the presentation, we have not talked about safety, and the student has not yet tested 120 Vac. 7 Display Objectives: Immediate hands-on measurement exercise to explain TouchHold. We recommend you use a battery for measurements because, at this point in the presentation, we have not talked about safety, and the student has not yet tested 120 Vac. 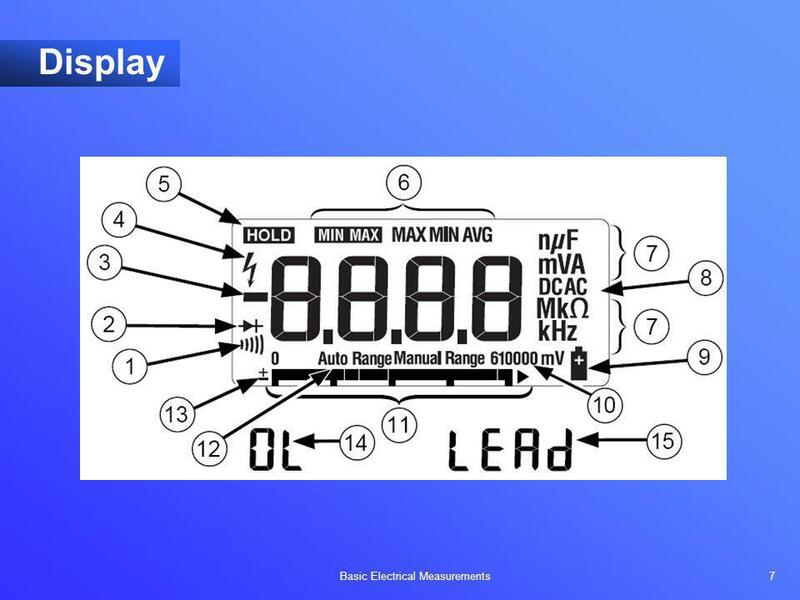 Diodes Capacitance AC Amps A DC Amps A Display backlight On/Off )))) Ω Objectives: Immediate hands-on measurement exercise to explain TouchHold. 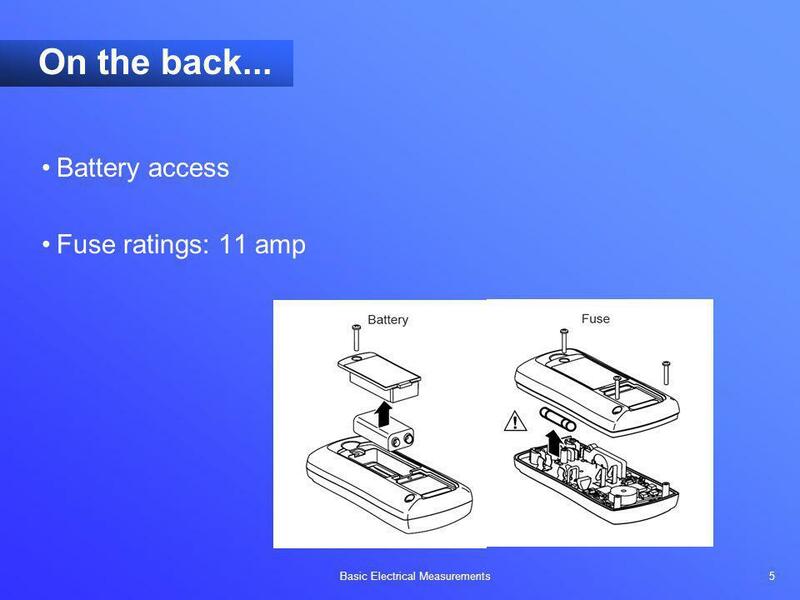 We recommend you use a battery for measurements because, at this point in the presentation, we have not talked about safety, and the student has not yet tested 120 Vac. Immediate hands-on measurement exercise to explain TouchHold. We recommend you use a battery for measurements because, at this point in the presentation, we have not talked about safety, and the student has not yet tested 120 Vac. 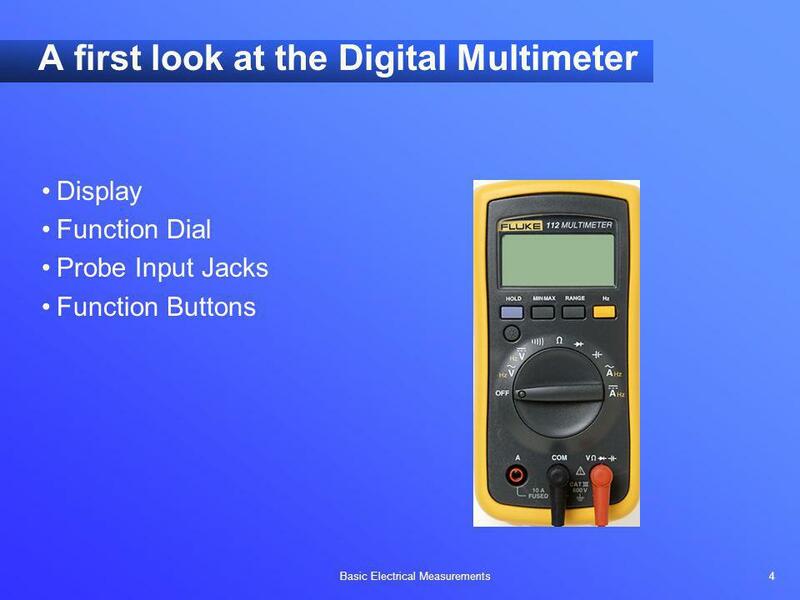 Selector Dial Probe Jacks Objective: Get the student to think about the safety integrity of test leads and probes, often the weak point in the overall safety of the meter. 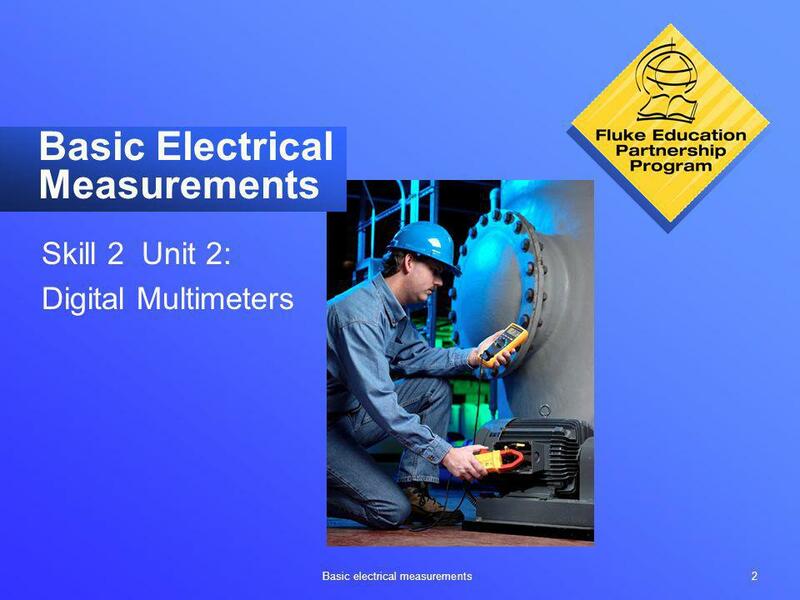 Module on safety focuses on the meter itself. Test leads are easy to neglect. However, a safety-designed meter with cheap or beat-up test leads, or leads not designed for high energy circuits, is like a new car with bald tires. Double insulation, finger guards, shrouds and recessed input jacks protect against electric shock from accidental contact with live circuits. Shrouds protect against the possibility that the probes could be connected across live voltage and the banana plugs be pulled from the meter. CAT ratings (III-1000 V or IV 600 V) are visible on the leads and probes. 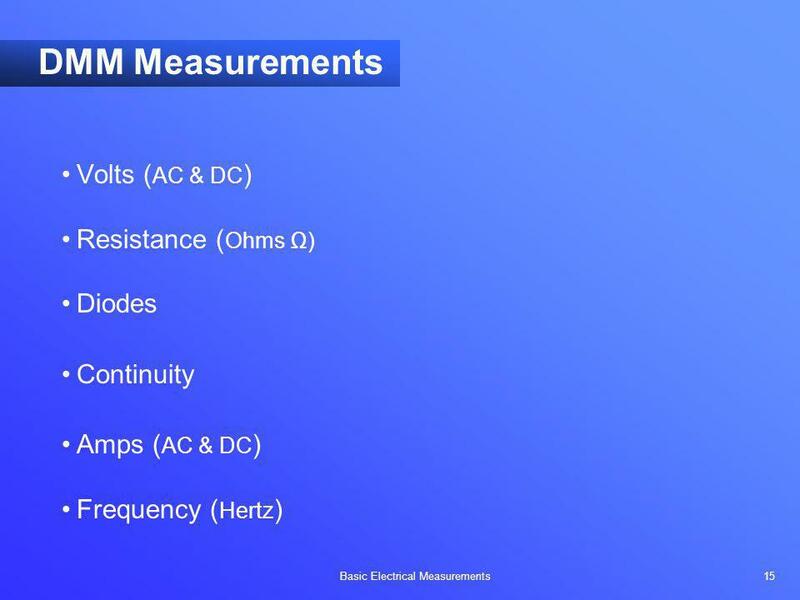 Test lead resistance is in the ohm range. A single lead can be tested by looping it between the Volts and Com inputs. 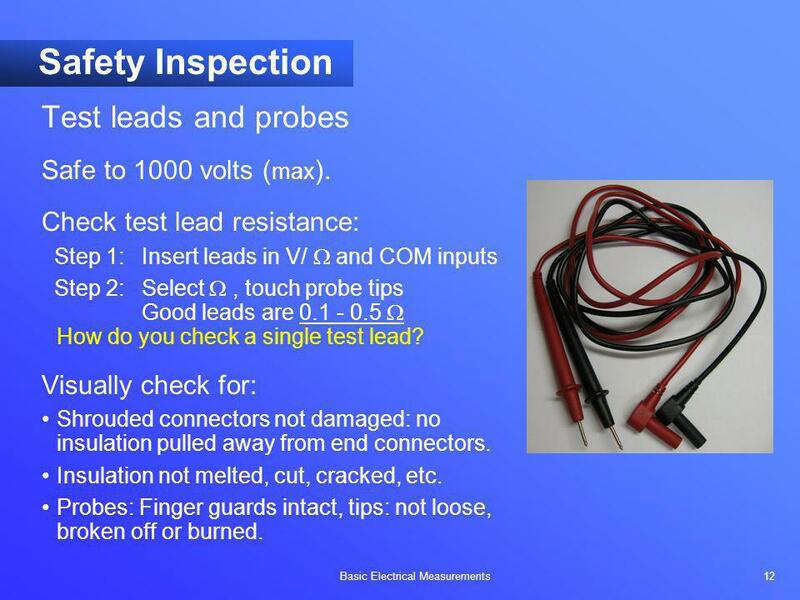 12 Safety Inspection Test leads and probes Safe to 1000 volts (max). 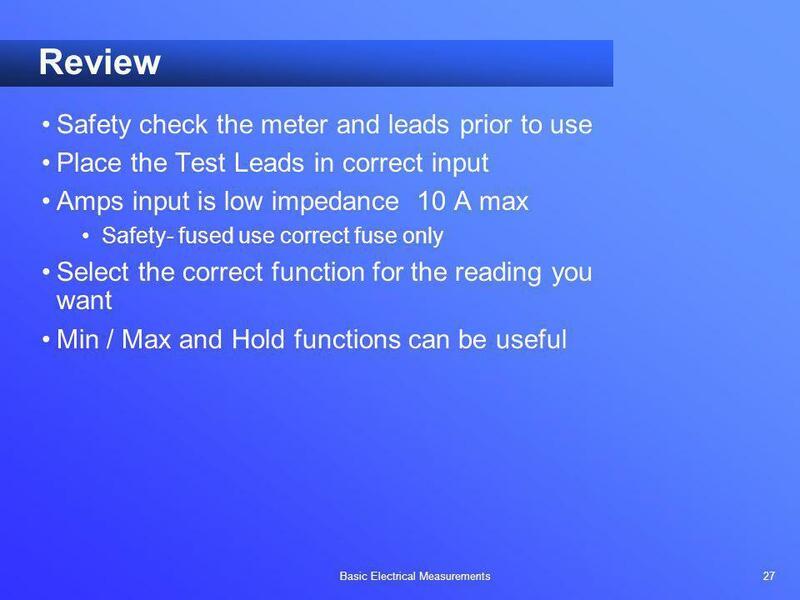 Check test lead resistance: Step 1:	Insert leads in V/  and COM inputs Step 2:	Select  , touch probe tips Good leads are  How do you check a single test lead? Visually check for: Shrouded connectors not damaged: no insulation pulled away from end connectors. Insulation not melted, cut, cracked, etc. Probes: Finger guards intact, tips: not loose, broken off or burned. 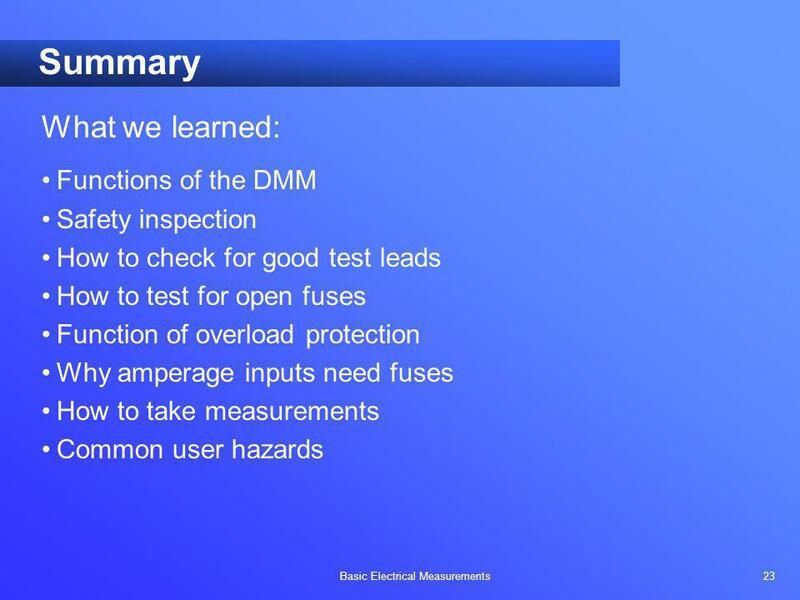 Objective: Get the student to think about the safety integrity of test leads and probes, often the weak point in the overall safety of the meter. 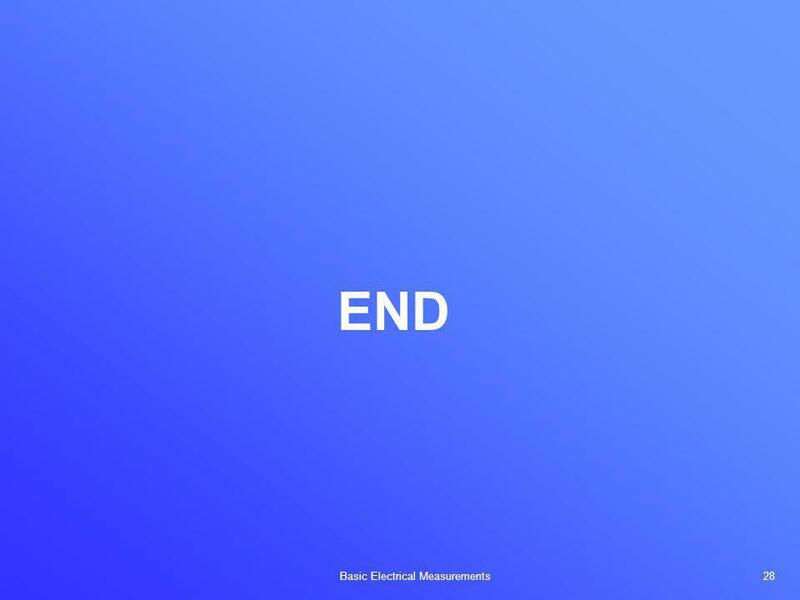 Module on safety focuses on the meter itself. Test leads are easy to neglect. However, a safety-designed meter with cheap or beat-up test leads, or leads not designed for high energy circuits, is like a new car with bald tires. Double insulation, finger guards, shrouds and recessed input jacks protect against electric shock from accidental contact with live circuits. Shrouds protect against the possibility that the probes could be connected across live voltage and the banana plugs be pulled from the meter. CAT ratings (III-1000 V or IV 600 V) are visible on the leads and probes. 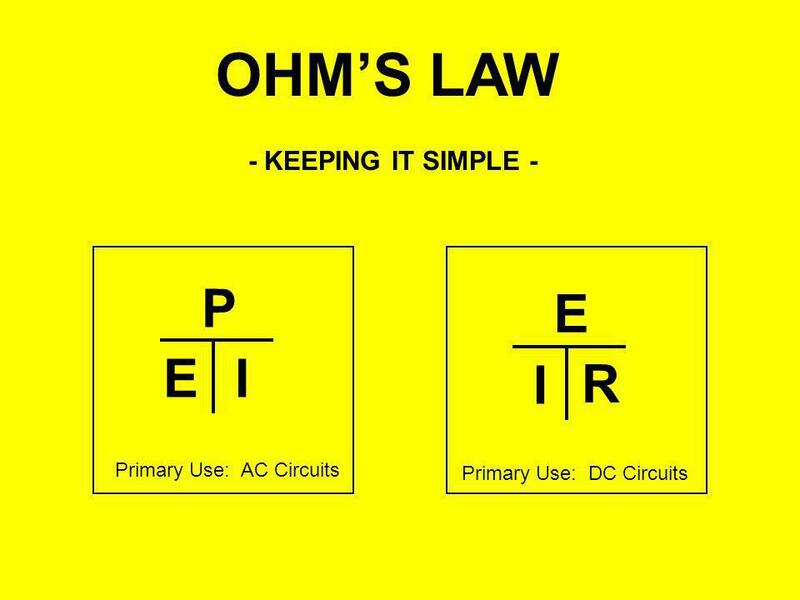 Test lead resistance is in the ohm range. A single lead can be tested by looping it between the Volts and Com inputs. Step 1:	Plug test lead in V /  input. Step 2: Select  Step 3:	Insert probe tip into A input and read value. (should be less than 0.5 ) Is the fuse okay? What would an open fuse read? Note: This test will only confirm that a fuse is good. It will not test for a wrong sized fuse being installed. 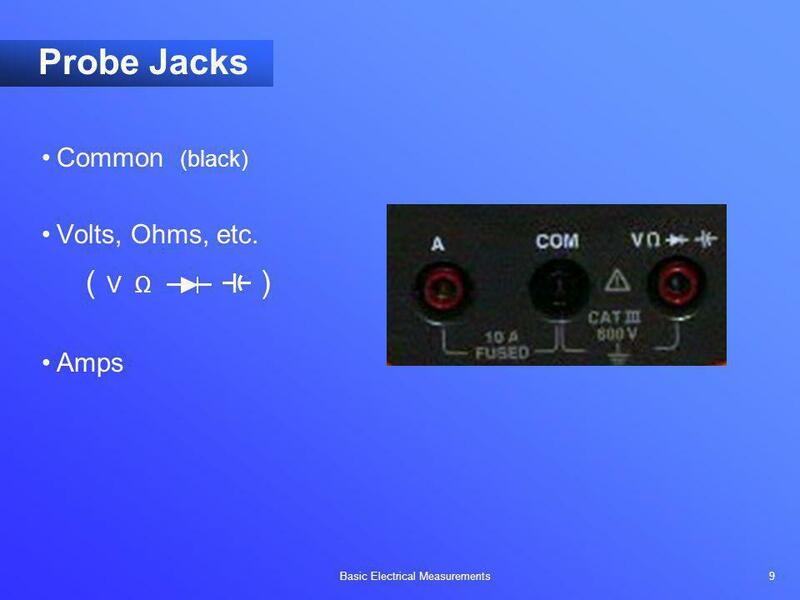 Objectives: Measure low input impedance of amps inputs. Quick fuse test. 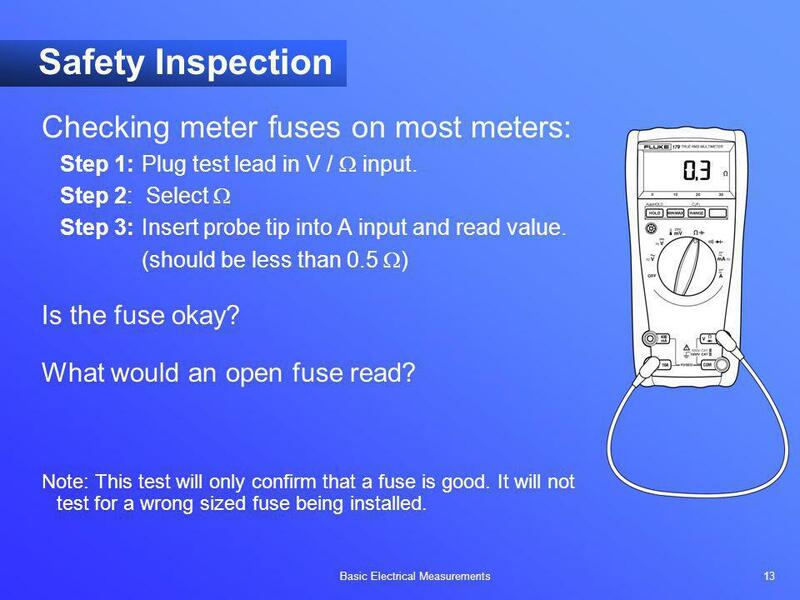 (Note that this test does not test for the wrong fuse being installed, as could happen if the original fuse was replaced with a low energy fuse. From a safety point of view it is preferable that a blown fuse not be replaced and the circuit left open if the correct fuse is not available.) 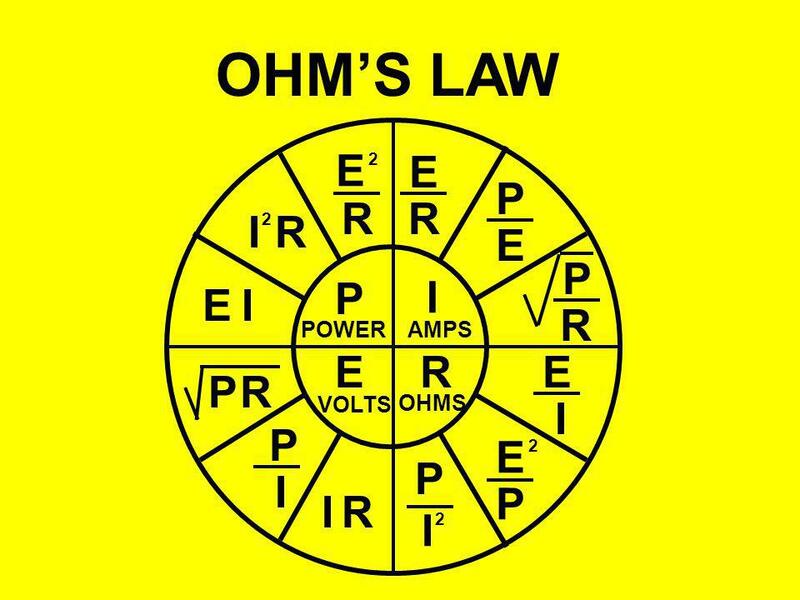 Measurements: A: = < 0.5 ohms typ. 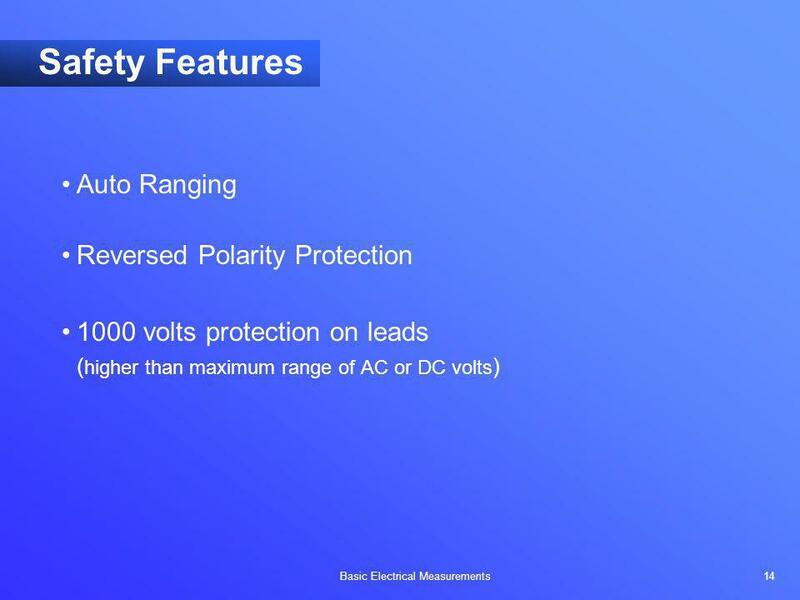 Voltage contact while in continuity or resistance Protection: Overload protection in ohms up to the meter’s volt rating. Measuring voltage with test leads in current jacks Protection: High energy fuses rated to the meter’s voltage rating. Shock from accidental contact with live components Protection: Test Leads double insulated, recessed / shrouded,	finger guards. Replace when damaged. 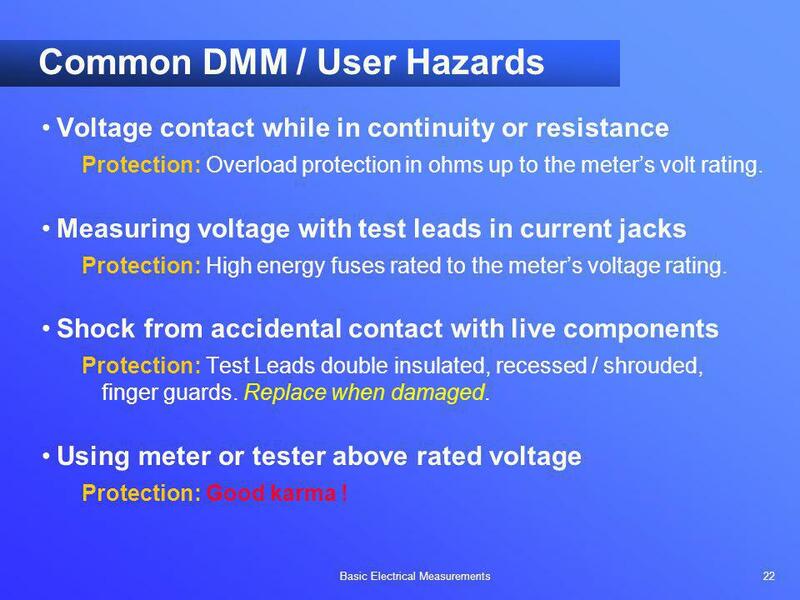 Using meter or tester above rated voltage Protection: Good karma ! 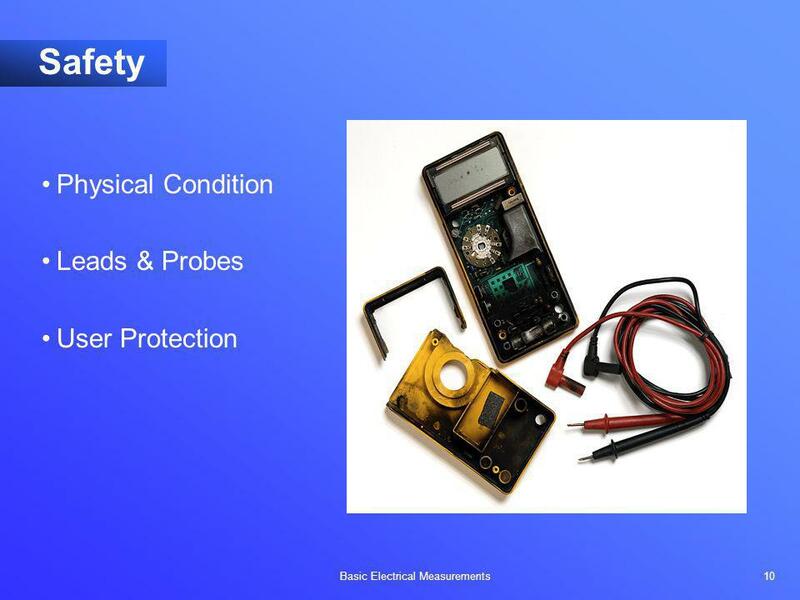 Safety hazards are broken into two broad categories, “operator error” which is avoidable and “electrical environment” (later slide) which is unavoidable. 1. The A/amps jacks on a DMM connect to a very low impedance test circuit inside the meter. When the low impedance of the DMM’s A/amps input jacks accidentally are placed across a power circuit, they in effect form a short-circuit. 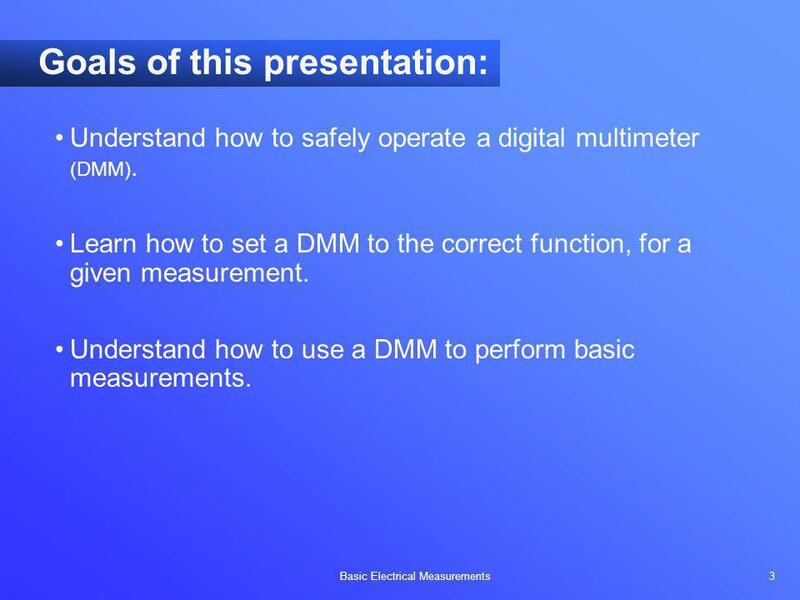 See graphics slide entitled “Misuse of DMM in ammeter mode” from the Fluke Electrical Measurement Safety education module. You can demonstrate the input impedance of the amps inputs by measuring it. Put the meter into ohms mode and attach leads. 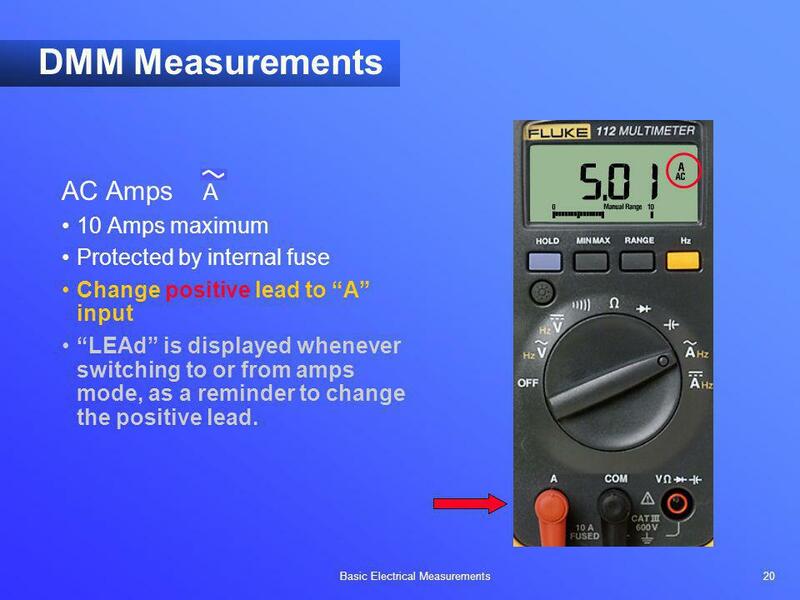 Use the red lead (connected to the V/ohm input) and put the probe tip into the 10 A (typical reading is 0.1 ohm ). An OL reading indicates an open fuse. 2. Older analog meters would typically self-destruct if they contacted power circuit voltages while in ohms mode. Download ppt "As a stand-alone overview of test tools." 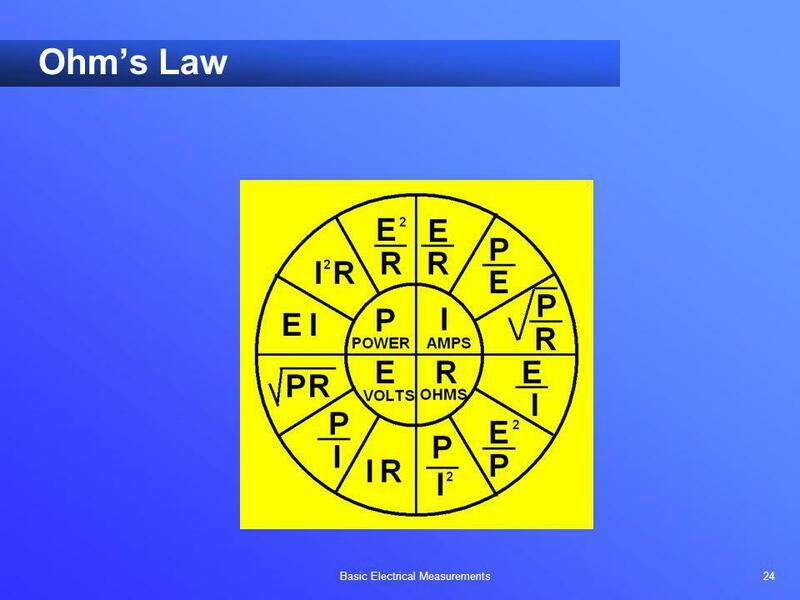 1 INTRODUCTION TO ELECTRICAL THEORY 2 What is Electricity? 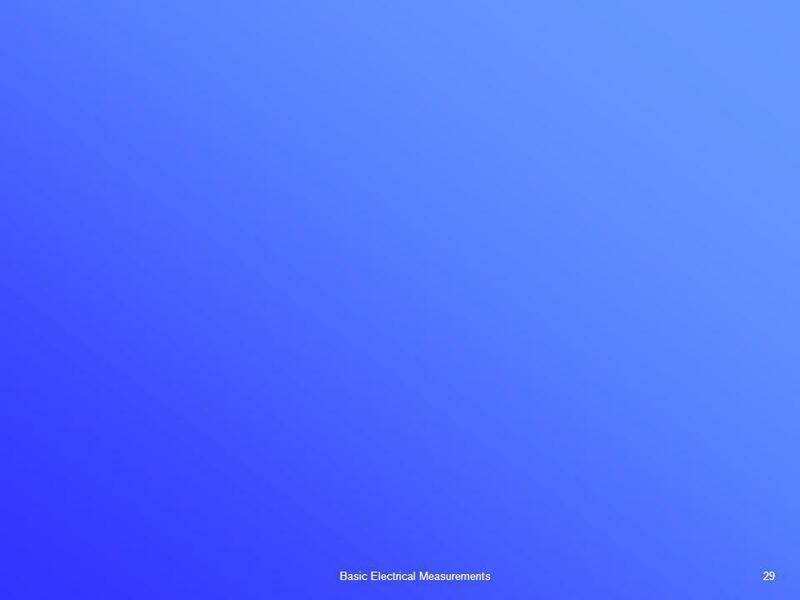 The controlled flow of electrons in an electrical circuit. A circuit must always be a complete. 1 Telephone Connection. 2 Introduction The section instructs you on how to install a required phone line to every receiver. PS – TEST 8TH GRADE SCIENCE. PROJECT TEAMS A 1 & 2 B 6 & 15 C 4 & 5 D 3 & 7 E 8 & 14 F 12 & 13 G 9 & 16 H 10 & 11. PS 7.8.1 – 7.8.3 TEST 8TH GRADE SCIENCE.